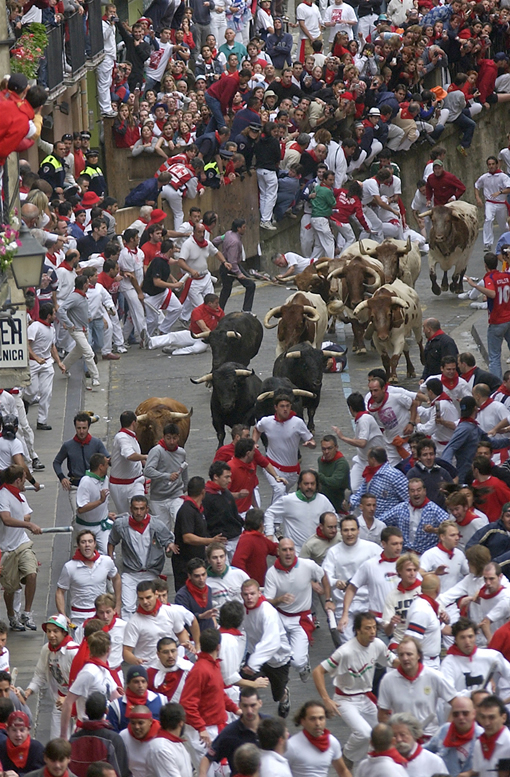 Due to the fact that the Encierro or bull run enjoys international fame, it is one of the most difficult events to watch live. This difficulty lies in the fact that, unlike mass sporting events, the race is not held in an enclosure, with controlled access by ticket, instead it takes place along the streets of the city, a city in which chaos reigns throughout the fiestas. Therefore, in order to watch the bull run live and experience all the thrills - something which television can never completely offer, despite the replays and slow motion - you need to get a place behind the few areas of fencing which line the route. You need to be there at least two hours before the start of the bull run, as there is room for only 1,500 persons - in the first and second row - with some guarantee of "seeing" the bulls close up. Furthermore, it is only possible to see a small section of the route covering no more than 15 to 20 metres of the street. Unquestionably, a balcony is the best place from which to see the bull running, because you can "experience" the thrills of the running to the full and also view a section of 100 to 200 metres. What is more, you only need to be on the balcony one hour before the start of the bull run. The problem is that the balconies along the route only offer space for some 4,000 persons and you are either a friend or relative of a balcony owner (which is the traditional thing in Pamplona) or you can go to a company specialising in renting out balcony spaces, for a price ranging between 50 to 100 Euros per person per day. The bullring can seat 20,000 spectators, but you also need to get a ticket if you want to get a good seat, whilst on weekdays the higher seats are free of charge, although they also fill up quickly and you need to arrive early to find a place. Moreover, in the square you don't really see the bull running, just the end of it when the runners fan out on entering the ring. Finally, you can always watch the bull run on TV or on the giant screens installed in the streets. A million people watch the bull running live on Spanish TV every day, from the comfort of their own homes, without having to get up early and wait in the morning freshness. In addition there are a further 80 million people who watch a later broadcast of the bull running through the international news channels and programs in the countries forming part of the Eurovision channel.